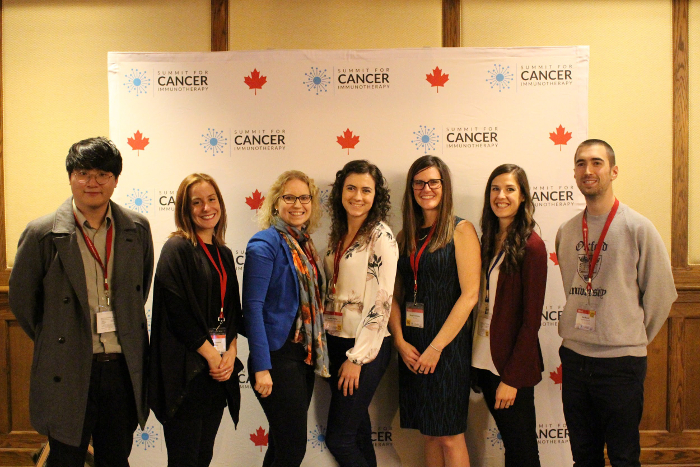 The 3rd Annual Summit for Cancer Immunotherapy (Summit4CI) that took place in Banff, AB, October 27-30, 2018, was a huge success! This year, we offered training opportunities oriented toward undergrad and graduate students, postdocs and other technical, clinical and research staff involved in bringing promising cancer biotherapeutics to clinic – all Highly Qualified Personnel (HQP) in BioCanRx’s Community! 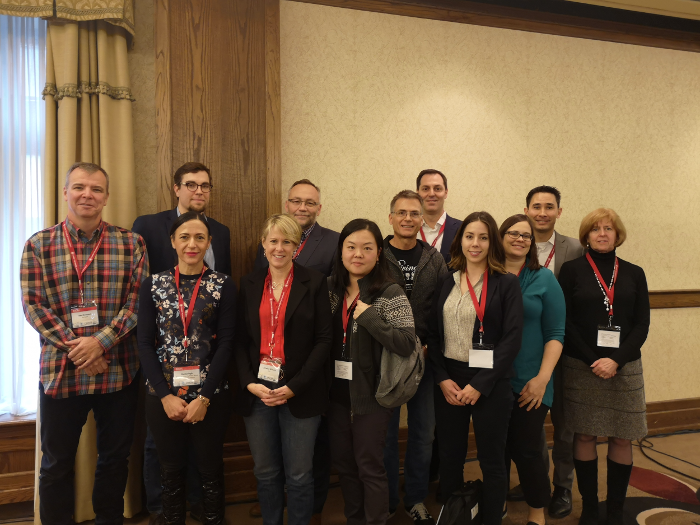 This year‘s Preclinical Experimental Design and Reporting Workshop took place as a pre-Summit day-long event. Participants were Network Investigators, HQP and Network Partners. 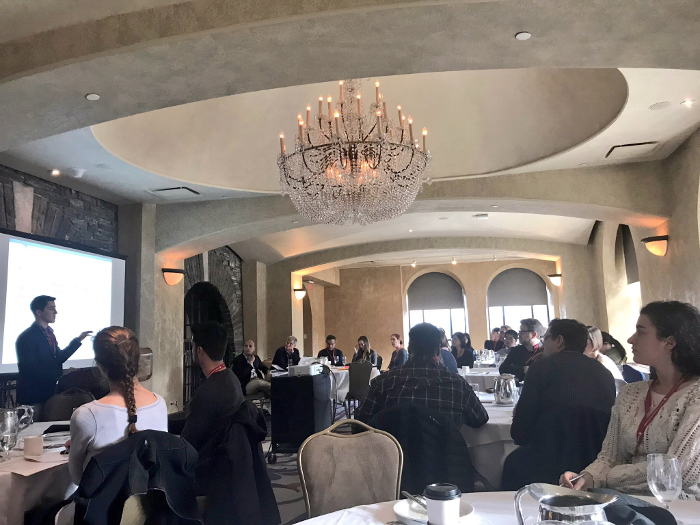 The workshop aimed to improve BioCanRx scientists’ knowledge of research design, analysis, and reporting of key methodological details according the NIH and ARRIVE standards. The workshop was developed and designed by BioCanRx and the BluePrint Translational Group at the Ottawa Hospital Research Institute (OHRI). Workshop presenters included Network Investigators Drs. Manoj Lalu, Dean Fergusson and Carolina Ilkow of the OHRI, along with Dr. Carly Barron of McMaster University and Josh Montroy, a Clinical Research Associate from OHRI. Thank you to Novartis for providing unrestricted support of this event! Josh Montroy presenting at the Preclinical Experimental Design and Reporting Workshop. On Saturday we kicked off the Summit4CI with a special HQP trainee day. Trainees were invited for a networking lunch after which Dr. Chris Nicholls, of Merck Canada, gave a talk on his role in the company and revealed some interesting career options for trainees. The keynote of the day was addressed by Dr. Jeffrey Hoch who gave a great, funny talk about health technology assessment in which he explained what is special about the Canadian health care system in that regard. After these plenary talks, trainees were offered various workshops by four amazing speakers. In the times of mass communication, it becomes more and more important to be able to communicate research with peers as well as non-peers. Dr. Barbara Vanderhyden provided useful tips and exercises on how to communicate with the public and media and presented some examples of successes she achieved by her outreach activities. For public outreach, as well as presenting data in the scientific setting, graphics are an important tool to get your message across accurately. Dr. Frank Delaglio presented examples of good and bad graphics, and, importantly, ways to improve the bad examples. Glenn Lesko gave trainees insights into the life sciences job market to help understand what job opportunities exist in the biotech sector. The interactive session also focused on tips and strategies of searching for a job and navigating through an early career. Once the job opportunities are clear, the next step is to be invited to interviews. For this, CV and resume writing is essential. Dr. Stephanie Eberle gave examples of successful and not so successful ways to convince employers and set candidates apart from others. These activities were developed, planned and implemented by the 2018 HQP Working Group, composed of BioCanRx Network HQP. A HUGE thank you to these individuals for their efforts in bringing together an excellent series of training events! HQP Working Group (from left to right): James Han, Marie-Laurence Tremblay, Maartje Wouters, Hayley McKay, Megan Mahoney (BioCanRx Manager of Training Programs), Brittany Umer, Robert Mould. BioCanRx encourages opportunities for HQP members to network with experts from various sectors. During this session, HQP had the opportunity to “speed date” in small groups with 12 professionals (“Experts”) who represented various careers and job sectors relevant to HQP. Some of the speakers included Dr. Christine Williams (Deputy Director of OICR), Dr. Brad Nelson (Scientist, BC Cancer Agency), Dr. Scott McComb (Research Officer, NRC), Dr. Bruce Seet (Director of Medical Affairs, Sanofi Pasteur), and many more. The program was well-received by both the expert panel as well as the HQP trainees who attended the program. HQP Meet the Experts sessions was successful thanks to the experts who came to support the HQP trainees. Pictured above, from left to right: Ken Newport (Chair, BioCanRx Board of Directors), Sheila Singh (Clinician-Scientist, McMaster University), Scott McComb (Research Officer, NRC), Christine Williams (Deputy Director, OICR), Glenn Lesko (Partner and Recruitment Consultant, Lock Search Group), Lee-Hwa Tai (Assistant Professor, Sherbrooke University), Brad Nelson (Scientist, BC Cancer Agency), Steve Seredick (Manager, Zymeworks), Natalie Wright (Clinical Research Assistant, The Ottawa Hospital), Mhairi Sigrist (Project Manager, BC Cancer Agency), Bruce Seet (Director of Medical Affairs, Sanofi Pasteur), Maureen O’Connor (Chief Scientific Officer, Forbius). The BioCanRx-Cancer Stakeholder Alliance (CSA) Learning Institute aimed to engage patient scholars with academic scholars (comprised of HQP members) through interactive activities which guided the process of knowledge synthesis, dissemination and exchange. The Learning Institute activities spanned throughout the BioCanRx conference (in addition to pre- and post- conference meetings), and provided opportunities for HQPs to 1) break down complex scientific ideas for patient scholars, and 2) understand the process of research translation from the patient perspective. The Learning Institute provided unique experiences for trainees to engage in translational research beyond the lab setting. Summit4CI had seven plenary sessions in which fantastic research was presented. In each plenary, a selected HQP trainee presented their work. Furthermore, there were two speed poster sessions, in which 24 trainees convinced the audience in two minutes to visit their posters. In total 112 HQP presented posters during the two poster sessions, which were well-attended and provoked much discussion. Summit4CI annually invites HQPs to deliver their up-to-date research through poster presentations. The poster presentations were separated into two evening receptions. We would like to thank all HQPs, judges, participants, organizers and sponsors for making this event possible. This year, 10 HQP were awarded for best poster presentations, speed poster presentations, and oral plenaries. 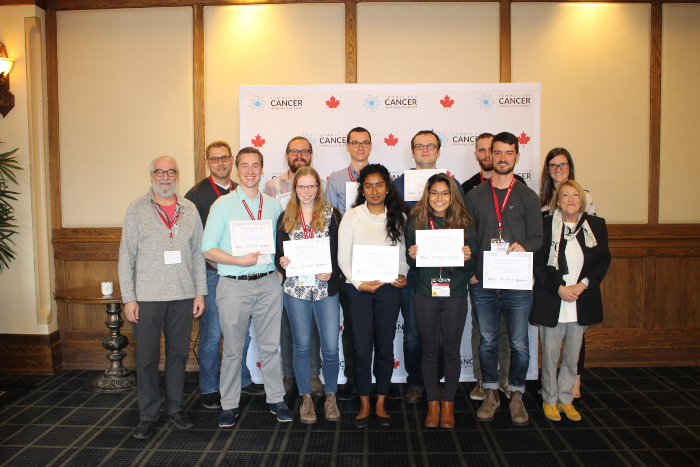 New this year, the Cancer Stakeholder Alliance Working Group, BioCanRx’s patient engagement and advocacy consortium working group, judged and adjudicated an award to the top oral plenary for accessibility and presentation of their research. For a list of awardees, please see below. The TIGIT:CD155 axis as a potential checkpoint pathway in immunologically cold ovarian cancers.